1 hot drinks | This Blog Rules | Why go elsewhere? As we dive deeper into the cold season, it’s time to swap ice cream and frappes for warm soups and delicious hot chocolate. But if you’ve been a hot chocolate junkie for a while, you’re starting to grow bored of the same “pour cocoa, pour hot milk, and stir” routine. Don’t worry, this is the Internet, which means that here lie countless of creative, unique, and downright sinful recipe ideas that can help you give a twist to your cup of precious molten delight. Without further ado, let’s discover the most awe-inducing hot chocolate recipes – ideal for those days off when all you need to do is watch reruns and snuggle under the blanket. Let’s start off with a simple yet effective twist: if you don’t know how else to enrich a recipe, make it boozy! Chocolate and bourbon go together almost as well as chocolate and rum. Throw a black cherry into the mix and you’ll get the same kind of flavor that makes boozy black cherry chocolates so incredibly sophisticated and popular. Read the recipe here for instructions! Sometimes all it takes to really give a unique twist to a drink is one particular ingredient. In this case, our star is peppermint, an unmistakable festive scent and flavor. Just like the pumpkin spice can do wonders for the ever-so-popular PSL, peppermint is going to give your hot chocolate a new edge – a Christmas-y edge. If sprinkling some peppermint over your hot chocolate’s whipped cream just isn’t quirky enough for you, dare to experiment and completely rewrite your own definition of hot chocolate. This recipe is a reinterpretation of hot chocolate from base to flavors, swapping the traditional dark cocoa for its lesser used white counterpart. The real spiciness and exotic edge of this beverage, however, is given by the peculiar yet astounding lemongrass-lavender combo. We’ll continue with the white chocolate propaganda because, dang it, it deserves some love too. In fact, many fail to realize the possibilities that come with white chocolate and its mild flavor, which is a perfect foundation to build all kinds of crazy flavor combinations. For example, take this combination. Cardamom and orange meet in your cup to create this recipe, which can be enjoyed on Christmas Eve and an average February night alike. Some say that there’s nothing that doesn’t go well with chocolate. We argue that coffee goes best of all. The popularity of the divine beverage typically known as mocha should serve as proof of that. If you love your coffee and cocoa alike, don’t make the mistake of missing out on this zesty recipe. It’s as classic as it easy to prepare (don’t let the ingredient list intimidate you) and make your own. Pink, cute, and delicious – this is a hot chocolate that basically begs to be part of a Valentine’s Day table. Even without this kind of special occasion, would anyone’s life be poorer while sipping on a strawberry hot chocolate? No? Of course not. Enrich your life and learn how to prepare this beverage, reserved only for those seeking supreme relaxation. You know you’re fighting a losing battle when you see fudge AND Oreo in the same sentence. For something that sounds so incredibly fancy, it’s actually incredibly easy to prepare it. Don’t believe us? Just take a look at the ingredient list below. You will never have to leave the comfort of your home to seek out cafes that can prepare this taste bud-soothing beverage once you learn how to prepare it at home. Caramel is great. Caramel with chocolate is even better. Salted caramel and hot chocolate should just be downright illegal. And here we are, at the end of this journey (which really tested our resilience). 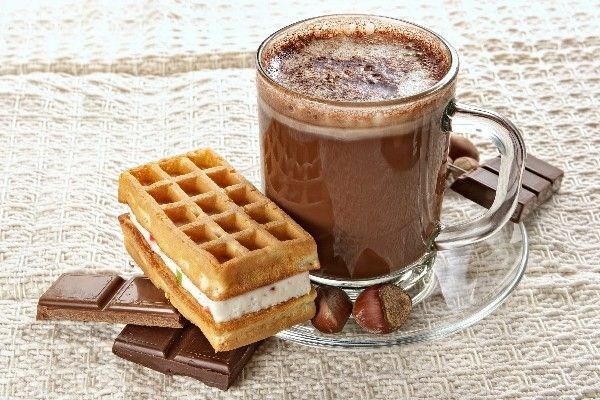 Which one of these hot chocolate wonders made you crave it more? It doesn’t even matter. It’s hot chocolate, meaning that you can prepare it with minimal resources and effort. Get those cups ready!